This beautiful fish comes from Guatemala and the Yucatan Peninsula of Mexico. They are mostly found in shallow river bank areas that have a fair amount of driftwood and rock for cover. They prefer slow, murky water. Firemouths have also been found in underwater cave complexes. This little friend likes to have a fair amount of open area in the middle of your aquarium to swim. They love slow currents and lots of spots on the bottom for cover. You should put some driftwood, rocks, and plants in the bottom your aquarium for your firemouth to hide in. These little guys do best in aquariums with other Cichlids that are roughly their size. Males tend to develop micro-habitat territories and will chase other fish away. They will get along well with peaceful bottom dwellers, like Plecos. Males have more pointed fins and and intensely red or orange throat area. The male will also have a longer dorsal fin and generally more vivid color on its body. When threatened or challenged by other fish, these Cichlids will flare their gills in an impressive display of color. They love to dig in the substrate, especially around the roots of plants. These little guys are not picky eaters. Mine will eat any type of food I offer. He will dart to the top and hit food fast, chewing on the run. These fish can spawn up to five times a year. Breeding these colorful little fish requires movement of a spawing pair to a breeding tank or using an aquarium divider to seperate them from other fish. To start the spawning, feed the breeding pair well and raise the temp to 82°F over a 48 hour period. Once spawning has begun, both male and female will become very aggressive toward other fish. Provide a flat rock in an over turned flower pot cave for the female to lay her eggs. The female will protect the eggs and the inside of the cave while the male protects the area around the spawning micro-habitat. In about four days the eggs will hatch. The parents will move the newly hatched fry to a bed that has been dug out in the substrate and guard them until they can swim on their own. The fry will number in the hundreds. Feed the fry finely crushed flake food or newly hatched brine shrimp. 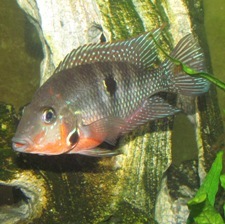 For more information, go to Wikipedia's Firemouth Cichlid page.